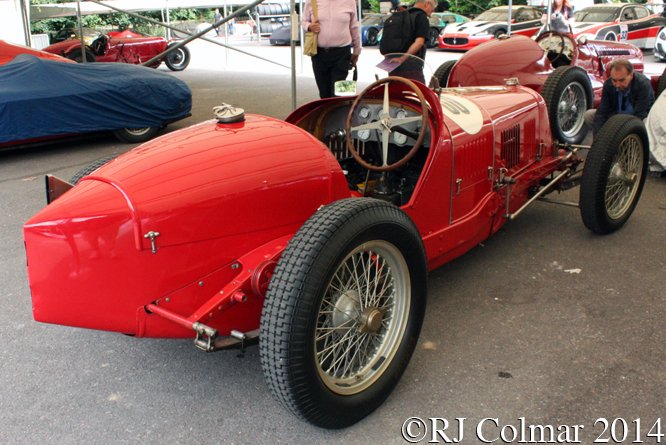 After Alfieri Maserati’s death in March 1932 the remaining Maserati brothers continued to develop his new 3 litre / 183 cui supercharged straight eight motor. 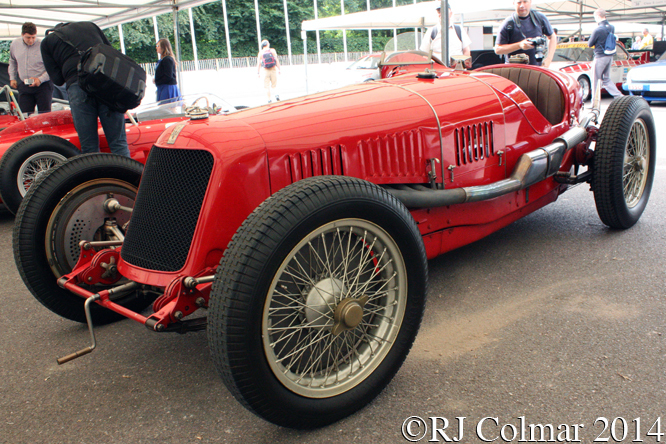 Before the end of 1932 Maserati had fitted a 220hp version of the new motor to an 8C chassis #3001 for Luigi Fagioli to drive in the Czechoslovak Grand Prix at Brno where he finished second to Louis Chiron in his Bugatti T51. With the financial collapse of Bentley in 1931 the Bentley Boys were struggling to find British built vehicles in which to race. 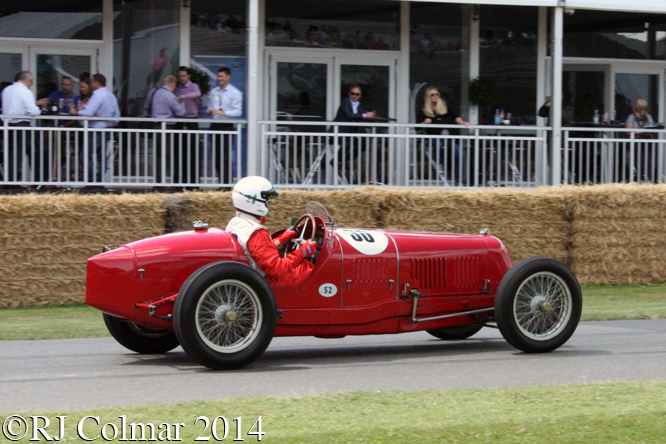 A second Maserati 8C chassis #3002, seen here at Goodwood, was bought by former Bentley Boy and 1928 Le Mans winner Bernard Rubin for fellow Bentley Boy and 1929 Le Mans winner Sir Henry Ralph Stanley ‘Tim’ Birkin to drive in the 1933 season. Unfortunately ‘Tim’ only got to drive #3002 once in the infamous 1933 Tripoli Grand Prix, a race which is best remembered for a story surrounding a legal syndicate which comprised three lottery ticket holders and three drivers who agreed to divide up various prize monies on offer equally in the event that one or more of the syndicate drivers won, came second, third or any conceivable combination thereof. 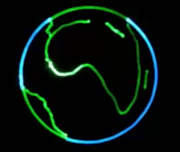 Of course being described by W.O. Bentley to be “the greatest Briton of his time” ‘Tim’ would have nothing to do with the syndicate and intended to do his best to ensure they did not get their result and led the opening four laps of the race. On lap 16 ‘Tim’ pitted which, due to his inexperienced pit team, is said to have cost him more time than his rivals and in particular syndicate members Archi Varzi, who did not need to stop and Tazio Nuvolari who did. Some sources say it was during this pit stop that ‘Tim’ accidentally burnt his arm on the exhaust of his car, others say it was during practice earlier in the event, but either way ‘Tim’ continued to finish third, 1 and half minuets, behind Archi and Tazio in that order, the same order to which both are alleged to have agreed on the flip of a coin on the morning of the race. Tragically the burn ‘Tim’ had suffered from the exhaust turned septic and that in combination with his malarial condition put him in hospital six days after the race and five weeks later Britain lost one of it’s most popular and able drivers. 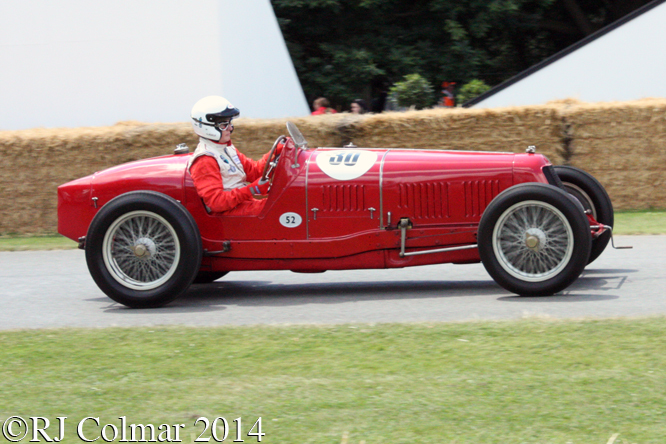 #3002 was driven in 1934 by Hon. 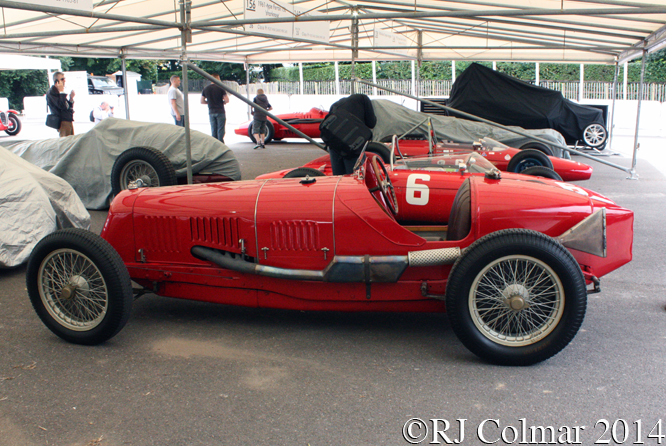 Brian Lewis for Noel Rees at Brooklands where it came second in the International trophy to another Maserati driven by Whitney Straight with both cars sharing the lap record. By 1937, following a string of ever less competitive performances with a variety of drivers #3002 was retired only for it have a post ’39-’45 war career, starting in 1946 when first Dudley Froy drove the car in the Easter ’46 VSCC Elstree speed trials. 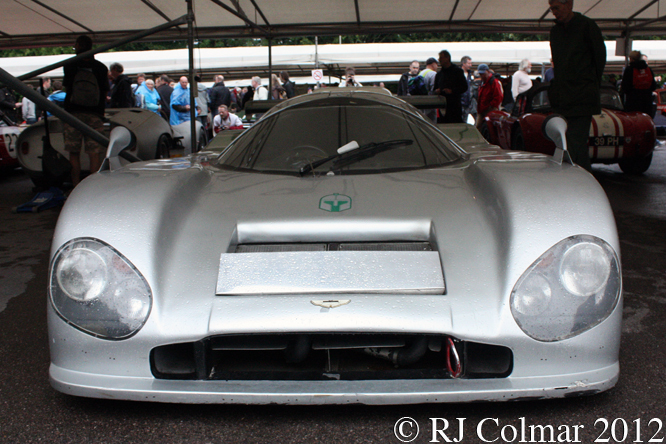 Next future legendary Aston Martin, Ford GT40 and Gulf Racing manager John Wyer prepared #3002 for T.A.S.O. Mathieson drive in some of the earliest post war French races at Bois du Boulogne, St Cloud, where finished a best 5th and GP du Rousillon, where TASO recorded a 6th place finish. TASO then started converting the 220hp car for road use and registered her for use on the kings highway, but sold her on in 1947 to Mike Oliver before the job was complete. 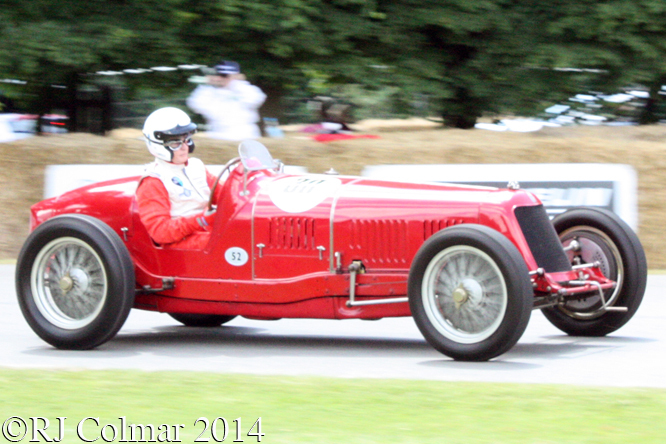 Once Mike had finished the conversion to road spec he drove #3002 to a seventh place finish in the ’48 Luton Hoo sprint. 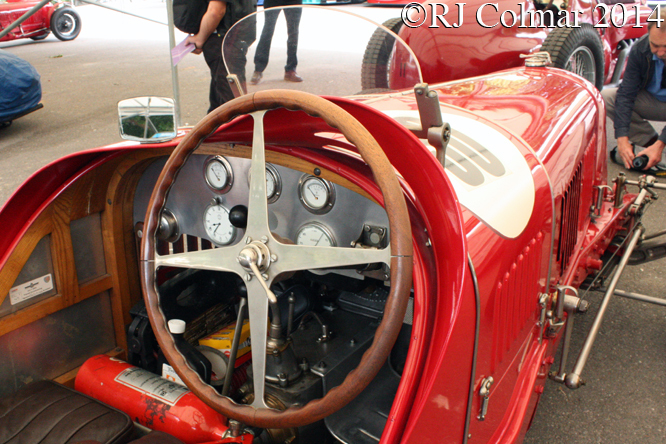 Later in 1948 new owner Squadron Leader John Crampton DFC continued competing with the car at the Prescott and Shelsey hillclimbs along with the Brighton Speed trials and at Goodwood up until 1949. The car was subsequently rebuilt, still in road going trim, by Alan Southon of the Phoenix Green Garage at Hartley Wintney before spending time in the United States. Cameron Miller then undertook a restoration of #3002 for Peter Kaus of the Bianco Collection which included replacing the body, the remains of the old one subsequently found their way on to another Maserati which I shall be revisiting next Monday. The Louwman Museum in the Netherlands now owns #3002 which is seen at Goodwood with Hulsoff Berend at the wheel. My thanks to FailedJourno at The Nostalgia Forum for pointing out that I confused today’s featured #3002 with the car I shall be revisiting next week. Thanks for joining me on this “Fatal Exhaust” edition of “Gettin’ a li’l psycho on tyres” I hope you will join me again tomorrow. Don’t forget to come back now ! 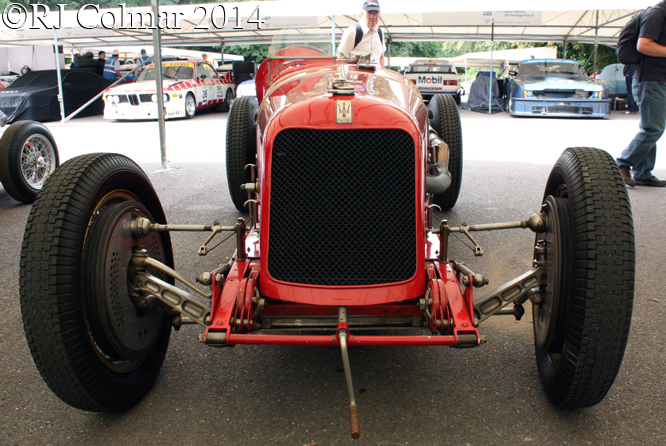 This entry was posted in Uncategorized and tagged 8C 3000, Berend, Birkin, Brooklands, Colmar, Crampton, Elstree, Fagioli, Festival of Speed, Froy, GALPOT, Goodwood, Kaus, Lewis, Louwman Museum, maserati, Mathieson, Miller, Oliver, Ralph, Rees, Rubin, Southon, Tripoli, Wyer on July 7, 2014 by Ralph. With a world caravan speed record in his pocket set with his twin turbocharged Aston Martin ‘Muncher’ Robin Hamilton came to an agreement with Aston Martin Chairman Victor Gauntlet to enter a partnership to form Nimrod in 1981 which set out to build Aston Martin powered prototype Group C and GTP racing cars. 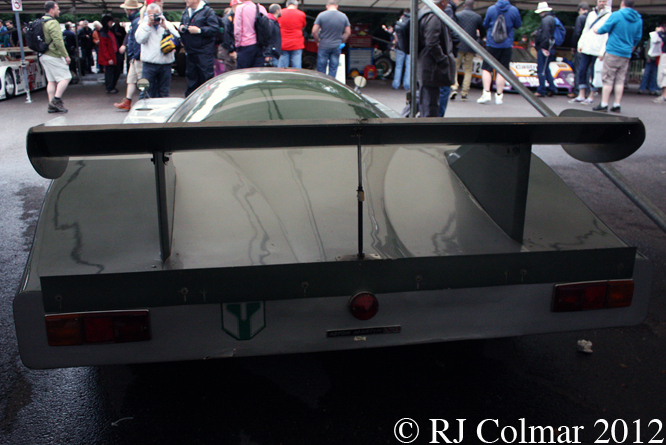 The design of the cars was credited to Eric Broadley, though I have always had my doubts about the extent of his involvement because the design does not feature ground effect aerodynamics that were de rigeur in Formula One and becoming rampant in prototype sports cars such as Eric’s contemporary Lola T600 Group C / IMSA GTP design shows. The Nimrod chassis tubs were certainly built by Lola, they were known in the Lola factory as T385’s and the cars do appear to bear a familial resemblance to the smaller open Lola T380 of the type Alan de Cadanet purchased in 1975. The heavily modified Aston Martin V8’s were prepared initially by Aston Martin Tickford and later by Aston Martin Lagonda. 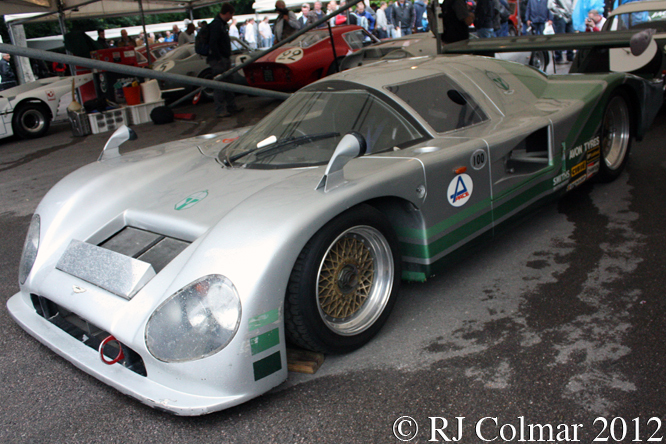 It is believed that the 1981 car, seen here at the Goodwood Festival of Speed, belonging to the Louwman Museum is the rebuilt wreck of the prototype that crashed before ever turning a wheel in open competition, that was never raced subsequently either. The Nimrods turned out to be underfunded and inevitably disappointed, the works cars best result, in second generation NRAC/2 guise that appeared in 1982, was a 5th place finish in the IMSA GTP series which fell to Reggie Smith, Lyn St. James and Drake Olson in the 1983 Sebring 12 Hours. At the end of the season Nimrod Racing folded. The best Nimrod finish in the World Sports Car Group C series fell to Ray Mallock and Mike Salmon on the Nimrods debut at the 1982 Silverstone 6 Hours. This private entry by Viscount Downe was independently developed by Ray Mallock until 1984 and proved quicker and more reliable than the works entries scoring the marques only Le Mans finish in 1983 when Ray and Mike were joined by Simon Philips and finished 7th from 23rd on the grid. In 1983 for the Daytona 24 Hours Nimrod manged to team up both 4 time Indy 500 winner and one time Daytona 500 Winner AJ Foyt up with fellow Daytona 500 winner and three time NASCAR Cup winner Darrell ‘Jaws’ Waltrip and an unknown Argentinian Guillermo Maldonado with Darrell’s sponsor Pepsi in their lead #11 car. They qualified 13th, but retired with engine failure to be classified 54th. AJ who had not driven the car in the race moved over to join Preston Henn in the Henn’s Swap Shop Porsche 935 and shared a victory with Preston, “Brilliant” Bob Wollek and Claude Ballot-Lena. Thanks for joining me on this “Wrecked Prototype Revived” edition of “Gettin’ a li’l psychoontyres” I hope you will join me again for Maserati Monday tomorrow. Don’t forget to come back now ! 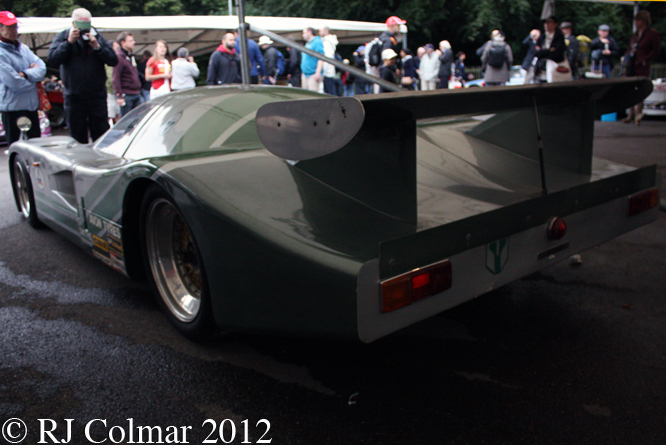 This entry was posted in Uncategorized and tagged Aston Martin, Broadley, Colmar, Daytona, Downe, Festival of Speed, Foyt, GALPOT, Gauntlet, Goodwood, Hamilton, Le Mans, Lola, Louwman Museum, Maldonado, Mallock, Nimrod, NRAC/1, NRAC/2, Olson, Philips, Ralph, Salmon, Sebring, Smith, St James, T385, Waltrip on June 29, 2014 by Ralph.